Composition: Pemeta : Each vial contains Pemetrexed 100 mg as Pemetrexed Disodium Heptahydrate USP lyophilized powder for IV infusion. Indications: Nonsquamous Non-Small Cell Lung Cancer- Combination with Cisplatin: It is indicated in combination with Cisplatin therapy for the initial treatment of patients with locally advanced or metastatic nonsquamous non-small cell lung cancer. Nonsquamous Non-Smail Cell Lung Cancer- Combination with Carboplation & Pembrolizumab: It is indicated in combination with Carboplation & Pembrolizumab for the initial treatment of patients with metastatic, non-squamous NSCLC. Nonsquamous Non-Small Cell Lung Cancer- Maintenance: It is indicated as a single agent for the maintenance treatment of patients with locally advanced or metastatic nonsquamous non-small cell lung cancer whose disease has not progressed after four cycles of platinum-based first-line chemotherapy. Nonsquamous Non-Small Cell Lung Cancer- After Prior Chemotherapy: It is indicated as a single-agent for the treatment of patients with locally advanced or metastatic nonsquamous non-small cell lung cancer after prior chemotherapy. Mesothelioma: It in combination with Cisplatin is indicated for the treatment of patients with malignant pleural mesothelioma whose disease is unresectable or who are otherwise not candidates for curative surgery. Dosage and Administration: Recommended Dosage and Schedule for Non-Squamous NSCLC: # The recommended dose of Pemeta in combination with cisplatin for initial treatment of NSCLC in patients with a creatinine clearance (calculated by Cockcroft-Gault equation) of 45 mL/min or greater is 500 mg/m² as an intravenous infusion over 10 minutes administered prior to Cisplatin on Day 1 of each 21-day cycle for up to six cycles in the absence of disease progression or unacceptable toxicity. # The recommended dose of Pemeta for maintenance treatment of NSCLC in patients with a creatinine clearance (calculated by Cockcroft-Gault equation) of 45 mL/min or greater is 500 mg/m² as an intravenous infusion over 10 minutes on Day 1 of each 21-day cycle until disease progression or unacceptable toxicity after four cycles of platinum-based first-line chemotherapy. # The recommended dose of Pemeta for treatment of recurrent NSCLC in patients with a creatinine clearance (calculated by Cockcroft-Gault equation) of 45 mL/min or greater is 500 mg/m² as an intravenous infusion over 10 minutes on Day 1 of each 21-day cycle until disease progression or unacceptable toxicity. Recommended Dosage and Schedule for Mesothelioma: The recommended dose of Pemeta, administered in combination with Cisplatin, in patients with a creatinine clearance (calculated by Cockcroft-Gault equation) of 45 mL/min or greater is 500 mg/m² as an intravenous infusion over 10 minutes on Day 1 of each 21-day cycle until disease progression or unacceptable toxicity. Renal Impairment: Pemeta dosing recommendations are provided for patients with a creatinine clearance (calculated by Cockcroft-Gault equation) of 45 mL/min or greater. There is no recommended dose for patients whose creatinine clearance is less than 45 mL/min. Premedication and Concomitant Medications to Mitigate Toxicity: Vitamin Supplementation: # Folic acid should be initiated 400 mcg to 1000 mcg orally once daily, beginning 7 days before the first dose of Pemeta and continuing until 21 days after the last dose of Pemeta. # Vitamin B12 should be administered, 1 mg intramuscularly, 1 week prior to the first dose of Pemeta and every 3 cycles thereafter. Subsequent vitamin B12 injections may be given the same day as treatment with Pemeta. Corticosteroids: # Dexamethasone should be administered 4 mg orally twice daily for three consecutive days, beginning the day before each Pemeta administration. Or, as directed by the registered physicians. Please see the enclosed insert. Use in pregnancy and lactation: It can cause fetal harm when administered to a pregnant woman. If it is used during pregnancy, or if the patient becomes pregnant while taking this drug, the patient should be apprised of the potential hazard to the fetus. Lactation: There is no information regarding the presence of Pemetrexed or its metabolites in human milk, the effects on the breastfed infant, or the effects on milk production. Women should be advised not to breastfeed during treatment with Pemeta and for 1 week after the final dose. Pediatric Use: The safety and effectiveness of Pemeta in pediatric patients have not been established. Patients with Hepatic Impairment: There was no effect of elevated AST, ALT or total bilirubin on the pharmacokinetics of Pemetrexed. Patients with Renal Impairment: Pemeta is primarily excreted by the kidneys. Decreased renal function results in reduced clearance and greater exposure (AUC) to Pemeta compared with patients with normal renal function. No dose is recommended for patients with creatinine clearance less than 45 mL/min. 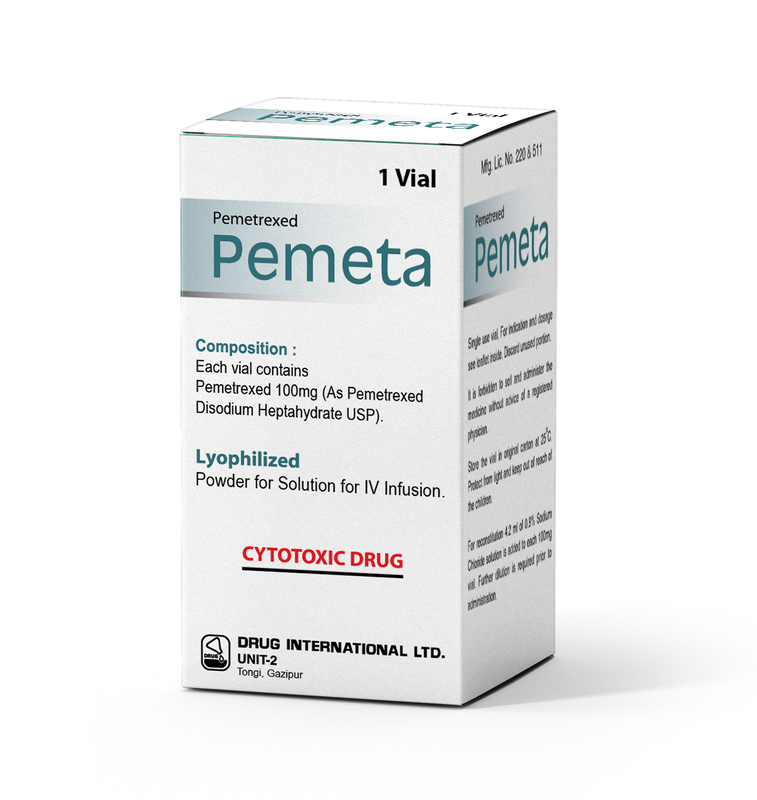 Packing: Pemeta: Each box contains one vial (10 ml) of 100 mg Pemetrexed USP lyophilized powder for IV infusion.